I’ve suited up for 77 football games over the last eight years. I’ve played cornerback and safety. I’ve been a captain and I’ve ridden the bench. I’ve made tackles, I’ve recovered fumbles, I’ve intercepted passes, I’ve held clipboards, and I’ve won championships. The number of football games on which I’ve commentated, however, is zero—until Saturday’s game, which was my first game in the press box, and my eighth game off the playing field. It may have been the tougher call to make, but it was definitely the right one. SportsManias is on the right track now. After being given the time and diligence it deserves, we’re looking for investors, UMVs are climbing, and content is perfecting. The hours of “leisure” I devote to the company during the school week, hours previously spent at practice and at film and in the weight room, are also time well spent. It’s strange how your dreams change as you grow older, but they do; and SportsManias is now my dream. Still, how couldn’t I miss the sport I’d loved for all of these years? Football has meant everything to me; it’s been the rock that kept me in orbit. It’s taught me many lessons, even that the toughest decision is probably the one worth making. I couldn’t stay away from it for very long. When I got back to school, Stagg Field haunted me. I didn’t know whether to run up to coach Maloney’s office and start ranting about how I was making my comeback in the spring, when all of the dust had settled and SportsManias was cruising and not launching, or whether to avoid game days and hide out at the Reg. Ultimately, the best route was one I was skeptical about at first, only because I was scared it would hurt too much—commentating Maroon football for Maroon TV, a station I helped co-found last spring. I played for the Maroons, though. So the thought of sitting in a box and talking about my former teammates as they were on the field without me made me wince. But it was the tougher decision to make, which meant it was probably the right one. Plus, I missed the game, in any capacity. My dad broadcasted sports during my childhood, and ever since I was a kid, I’d wanted to be some sort of sports media guru. Sure, SportsManias allows me to stay around football, but being at home on my computer while I could still be out there playing doesn’t quite fill the performance void—the nerves, the pressure, the thrill, the success on game day. I figured color commentating, even on my former team, might work for me. Saturday started unorganized and hectic, just like any other game day I’d ever been a part of. I woke up at 9 a.m., before my football-player roommate. I woke him up too. I hadn’t done nearly enough homework for the broadcast at 1 p.m., but we go to the University of Chicago; we know how to cram. The real problem lay in the fact that my dad was flying into town. He’s the one who really got me into sports—football especially—and he was also the one who bought three tickets to watch his son play before the season, before he knew I wouldn’t be playing. Still, my dad was flying up and he was arriving at my apartment at 10:30 a.m. The thing was, I had to help transport equipment for the broadcast at 10 a.m. So I took a bus over to “The Cage,” but by the time we had the cameras, standing outside of Logan, my dad was at my front door, standing outside of Kimbark Plaza. He called me. Typical. But my dad, being my dad, obviously knew me and all of my flaws, and graciously gave me, and the game day crew, a ride to Stagg, where we dropped them off. Following the short diversion, my dad and I headed back to the apartment to get ready for the game and to drop off his luggage. What followed was routine; different, but the same as the 77 football games in the eight years before it. I suited up. But instead of sliding my arms through a pair of shoulder pads, I slid them through a sports coat. Instead of kneepads, khakis. Instead of cleats, loafers. Instead of a maroon helmet, a maroon tie. One thing I experienced on Saturday for the first time in a long time, however, was spending pre-game preparation with my dad. He fixed my tie and my sleeves, just like he used to tweak my jersey back when I played flag football. Hurriedly, I printed out my Case Western notes and studied them the way I’d grown accustomed to studying the playbook pre-game. It was practically the same: What were the team’s tendencies? Who were their top players? The only difference was hammering down name pronunciation. Pre-game in the press box made for a new locker room. One with more thinking and scrambling, and less hitting and backpedaling. With 45 minutes left before kickoff, my dad and I approached the Homecoming tents for a pre-game meal, and as we ate, the defensive backs walked past—my position group on the team. Their entrance was announced over the loudspeaker and their jerseys fit them better than I remember mine fitting me. I watched them walk through the tunnel of halfway fans and onto the same track I’d walked 20 times before, Saturday being my 21st. Getting anxious that they were out there and I wasn’t, I signaled to my dad that it was time to go. So we followed the DB’s lead, behind coach Moore and the first-year corners. They were in warm-up lines by the time we crossed paths, and when we did, wide receiver Dee Brizzolara and linebacker Brian Duffy and cornerback Mychael Gilliam gave a wave as if I was invited to join, but I didn’t. With the wind in full force and my tie flapping over my shoulder, my dad and I waved back and kept walking, past the field and into the stands. 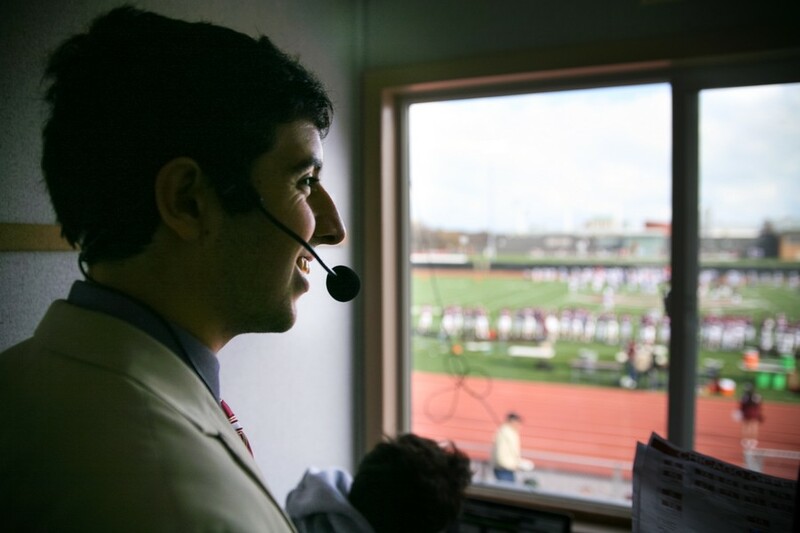 Now it was game time, except instead of middle linebacker Alex Dzierbicki giving me the calls, I stood next to play-by-play announcer and fellow Maroon TV co-founder, Alex Sotiropoulos. And then the kick. The game started well for the Maroons, but didn’t finish in their favor. Special teams swung the score the Spartans’ way. Blocked punts, dropped kicks, and penalties were the moral of this story. In the press box I ran through sentences and tackled points. I broke up strategy and pursued clarity. My commentating wasn’t without its fumbles, but for my first game I was proud. My dad stood by my side in the press box the entire time, in the booth labeled “Maroon Coaches.” No coordinators were present in the box, just my dad with his feedback and advice between drives and quarters. “No, no it didn’t,” I said. I plan on returning to football this spring and I plan on playing my senior year. But after Saturday I know there is life after football. It may not be on the playing field, but it’s not far off. It’s just up the bleachers and into the box.